The Omni 64 Automotive Masking Tape is a premium quality tape that is pressure-sensitive and is utilised in various industries. Also known as ‘painter’s tape’, it is used mainly in paint jobs for surface protection, stencilling, spraying, and for getting a clear border. As the name suggests, the tape is applied on a particular area in order to mask the space. Once the job is done, the tape is removed for the surface for making patterns and designs. The Automotive Masking Tape comes with a premium rubber solvent adhesive. 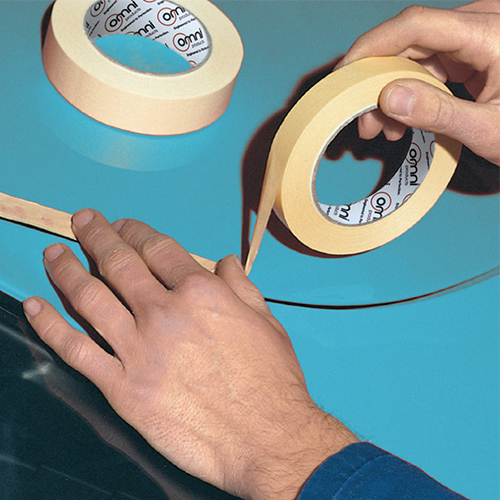 This masking tape has been specially developed to function in wet conditions as well as withstand temperatures up to 80 degrees Celsius for over 30 minutes. Ideal for industrial and automotive applications, these tapes are hand-tearable and easy-to-use. Masking tape is a natural white colour and is available in various sizes to cater to the different applications. Omni has inhouse tape slitting machinery so masking tape can be custom made to any required width. Manufactured in Italy, Omni’s General Purpose Masking Tape is premium quality and has been engineered to perfection.